March 8th - Hello from sunny Chicago! My day started out very well - I was actually able to get on the road by 5:30 - shocking I know. And, it just continued to get better and better! The Marketplace was the first area open - the first place I stopped at was the AIX Records booth. Very interesting experience - Mark Waldrep has built a state of the art studio and records musicians in a rather unique manner - instead of separate booths with their own headphones, they are all in the studio together. He stated that he felt the recordings went so well because the musicians were really able to "feed" off one another. Mark uses different microphone configurations to record in stereo, "audience" perspective, and true surround. They also produce video for the entire session and it is formatted to blu-ray. 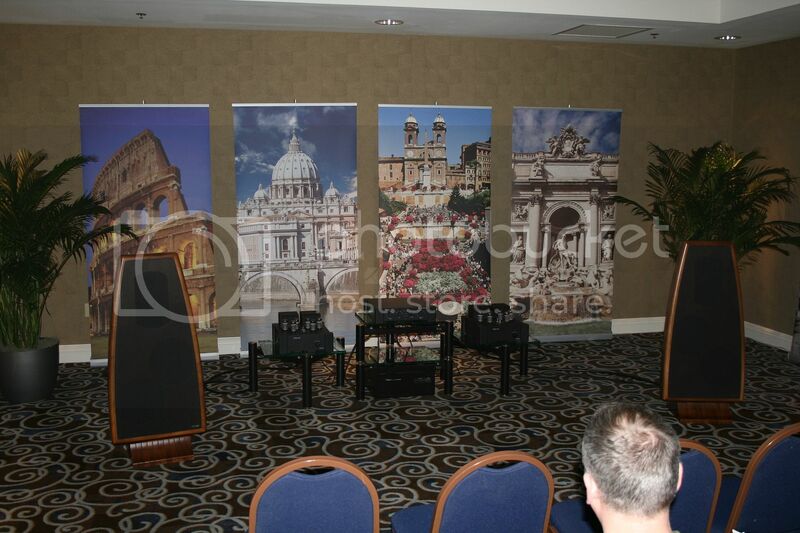 He also had set up a conference room with a JVC DLA-RS66U3D projector, OPPO-95, and Bryston SP-3 Pre/Pro. He had set it up to use the HDMI out from the OPPO and use the Brystons DACs. 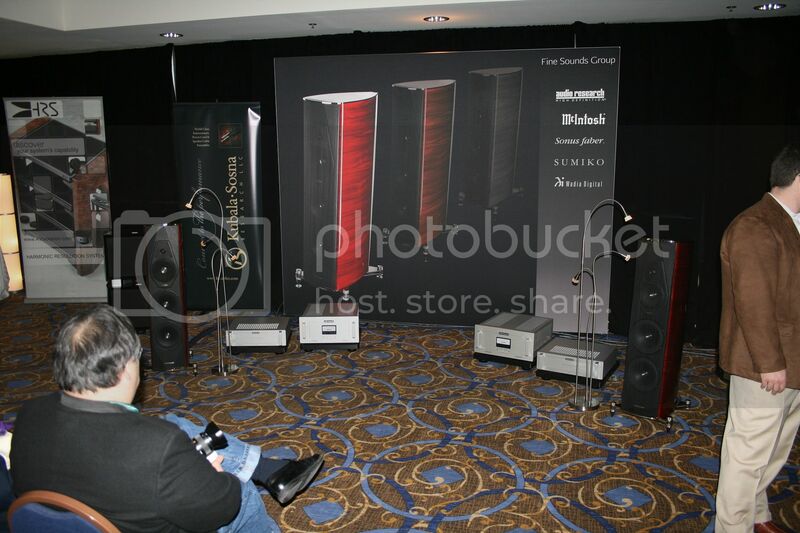 The speakers were the B&W 802 Diamonds - he had 4 - with the seating located in the middle. He then demonstrated the three different recordings on each track. I was utterly amazing at how fantastic the full surround sounded - it really felt like you were completely enveloped in sound. It was rather odd to be looking at the screen seeing all the musicians but having the sound come from all around - but turning on Pure Audio made the experience quite astounding. Perhaps the best way to explain was that "audience" perspective felt like you were in the audience while full surround felt like you were right on stage in the middle of all the musicians. 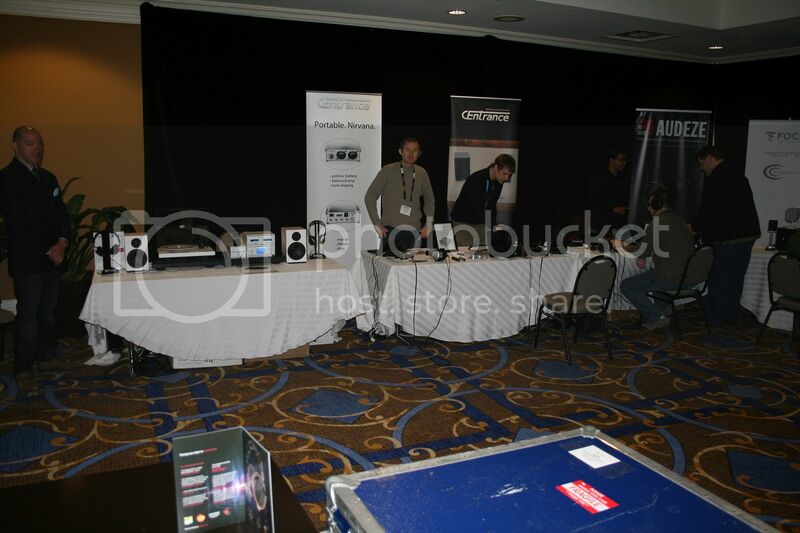 Please use the AXPONA 2013 Discussion / Comments thread for questions and comments. I then made my way through the marketplace. 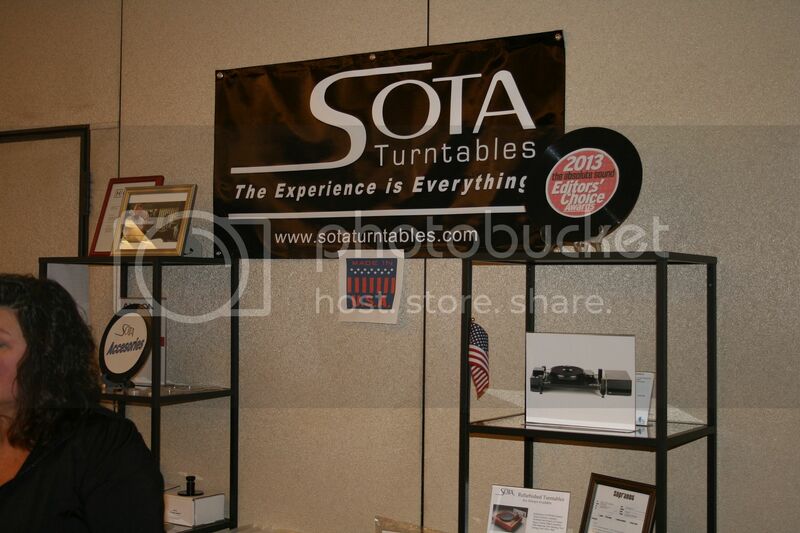 I stopped first at the Sota turntables booth where they had three different turntables set up. Kirk and Donna Bodinet are the owners, and I had a chance to chat with Donna for a few minutes. She told me that two of their players had been used for the TV show House - one is his office and one at his home. If you have seen the show, you will recall the sequence where he is lying on the floor in his office with a set of headphones on listening to vinyl - that is one of Sota's players. They also were asked to provide a "prop" for The Sopranos, but it did not end up being used. However, they were specifically mentioned in one episode! I have never been a big vinyl person, but I wanted to stop and take a listen so I listened to the Moonbeam. 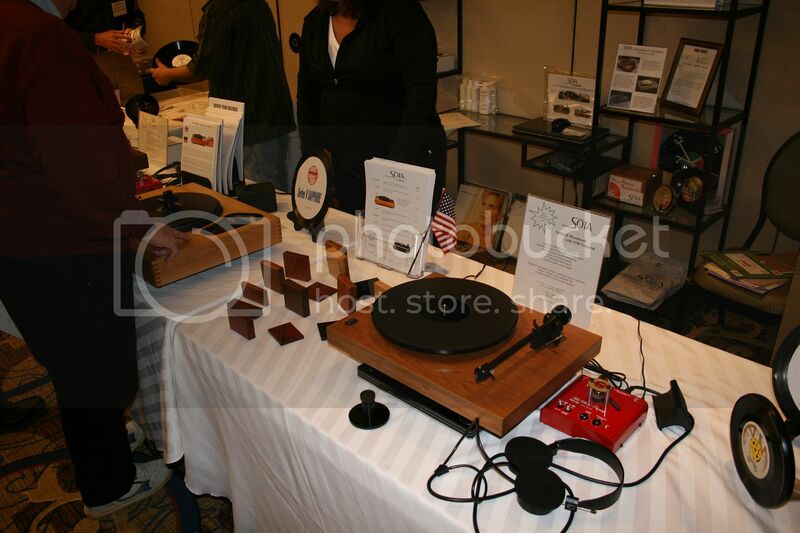 It was a very different experience for me - I really came out of today with a better appreciation for a good turntable. As I continued through the Marketplace, I came across a couple of locations selling vinyl and SACDs - if anyone is interested in more information on these, please let me know as I picked up a catalog with a full list of inventory and pricing. The Phono II allows the user to select between 3 different tonearm / cartridge combinations as well as 4 different gain selections (40, 50, 60, and 66db). It also allows for simple switching from Moving Coil to Moving Magnet cartridges and has Standby, Mute, and Run functions. Again, non-vinyl guy here but I just had to give this system a listen. I was shocked to get the sensation that the singer was behind me instead of to my side - quite exhilarating. This could have been a function of the headphones, but irregardless it was well worth the visit. For more information, you can check out DSA here. I wandered a bit to get a feel for where everything was, and it just so happened that the first room I chose to go into was one of the Quintessence Audio rooms. 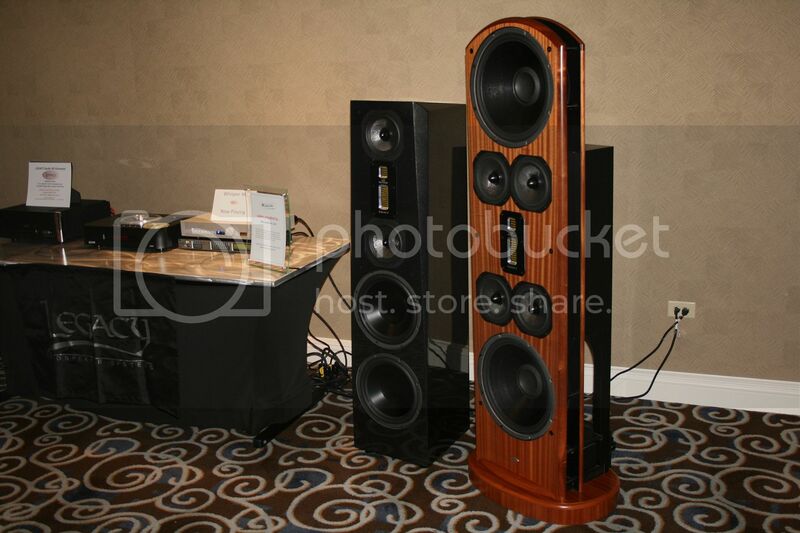 Ironically enough, it just so happened that these contained the most expensive speakers that I saw today - the Focal Grande Utopia EMs at an MSRP of 190K. One thing you cannot quite get a feel for from the pictures - these stand 6'8" high! John (The rep from Quintessence Audio) pulled the back panel off the speaker for me and showed me the series of jumpers that allows the Grande Utopias to have up to 1800 different settings. There is also a "crank" in the back panel that is used to physically adjust the upper portion of the speaker so that you can adjust the drivers to the targeted area. He then showed me an example of how the inverted dome tweeters are constructed in such a way as to reduce the mass of the tweeter assembly (coil, etc) so that it is easier to move and control. He stated that most manufacturers will not attempt this type of construction as the slightest mistake in assembly means that it cannot be used - they have approximately 15% of the tweeters that need to be discarded as they have very stringent QA. He then brought out one of the beryllium domes for us to hold. Once you put it in your hand, you could not feel the weight of it at all. He actually tossed it in the air - it fell to the ground like a feather. One of the benefits of beryllium is that it dissipates heat incredibly well - in essence acting as its own heat sink (beryllium is actually used in F16 brakes). 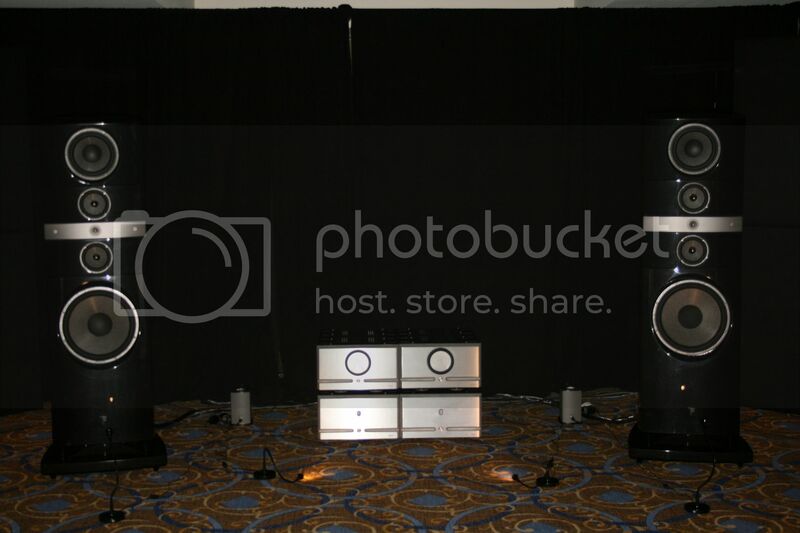 The amps used in this set up were Pass Labs XS 300s - it is a Class A amp that has an MSRP of 85K for all 4 chassis pieces each of which weighs in at about 150lbs. The dynamic range of the vocals and instruments on these speakers was amazing - and they actually had the LF level turned all the way down as it was too much for the size of the room - it got really boomy when he turned them up a bit. Now I know why JJ is so enamoured with the inverted dome - it really was amazing that I did not feel fatigued at all and they were not quiet by any stretch. More to come from Friday's experience - but as I am falling asleep on the laptop, it will have to wait until tomorrow. Good morning! Some more sights and sounds from Friday! 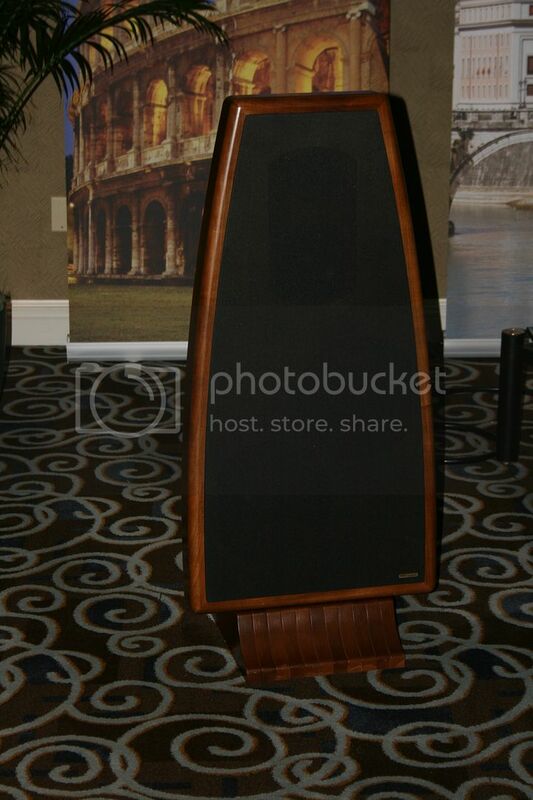 You will more than likely tire from reading this for every speaker, but, wow, what a gorgeous speaker. One thing I noticed going through each room - most of the speakers deviate from the traditional rectangle design which I personally enjoy. In my opinion, it really gives the speaker a more aesthetically pleasing feel and makes it something to be shown as well as heard. 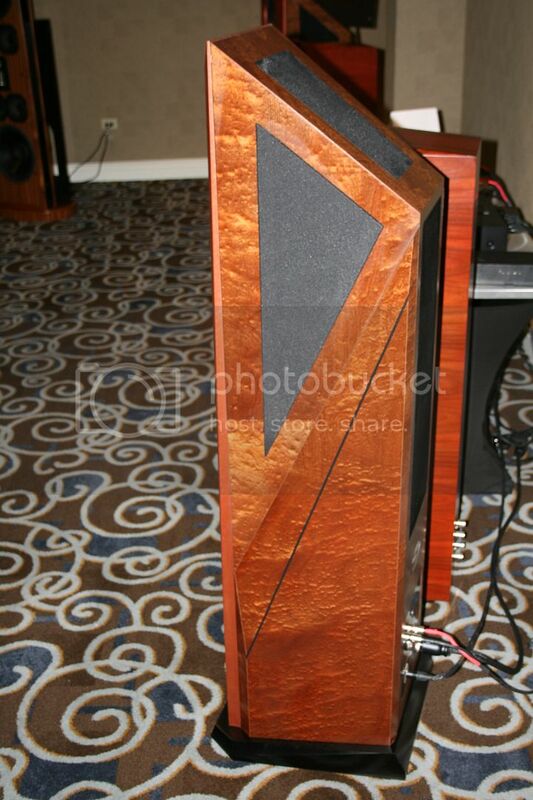 Now, that is not to say there are not some beautiful rectangle shaped speakers - my last visit of the day attests to that - but to me it just makes them stand out in a room. These were bi-amped using the Audio Research Reference 250 Tube amp with an MSRP 26k per pair and the Audio Research DS450M solid state amp which have an MSRP of 11k per pair. 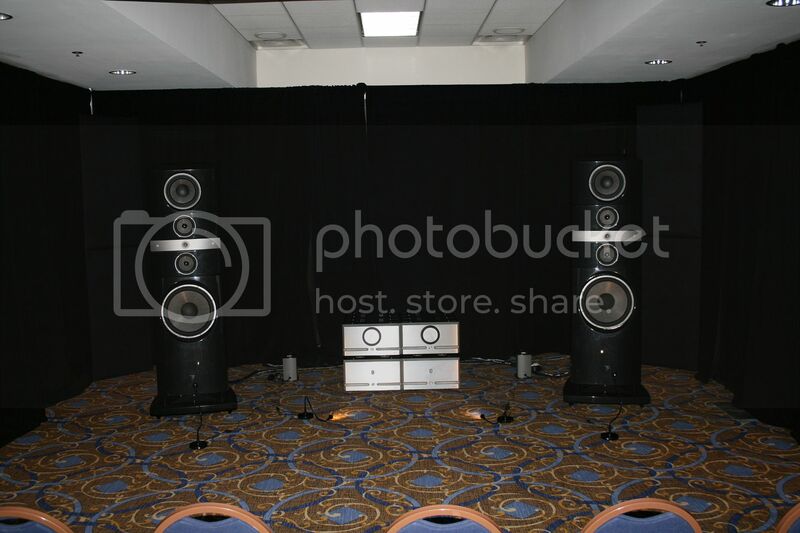 There were 4 REL Gibraltar G-1 subs also set up and they had them crossed over at 25Hz which really meant that the Futuras were pretty much doing all the work. 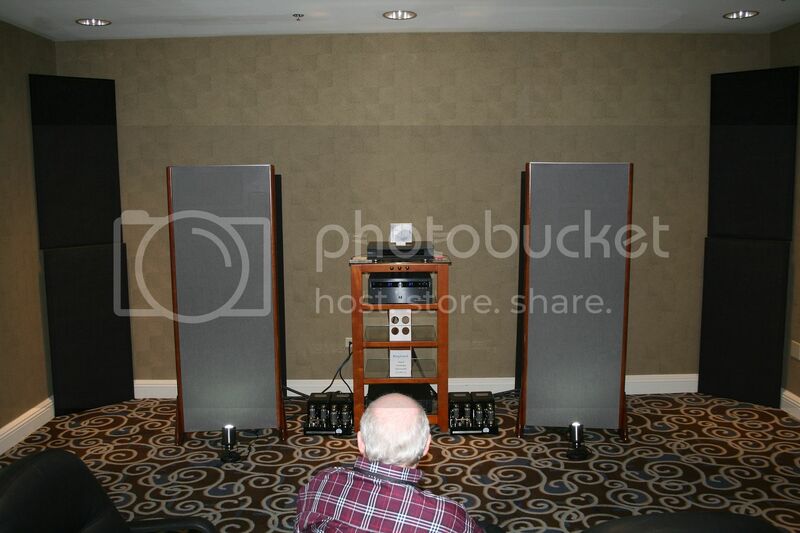 They also were using the Audio Research Reference DAC. A couple of points on the design - the Futuras use a Tuned Mass Damper that has multiple tuning frequencies to convert residual vibrations into heat as well as Stealth Reflex which is a patented Sonus Faber solution implementing a para-aperiodic venting system. It allows them to reduce the dimensions of the cabinet while at the same time attaining lower frequencies with lower distortion. The cabinet itself follows the Lute shaped design. I sat down to listen to the Futuras - and almost right away they just completely disappeared - which, given their appearance, it quite astounding. Dynamics were amazing - I recall one track in particular which had female vocals with a bass guitar at some point and this speaker handled that sequence quite well - neither sound overpowered the other. 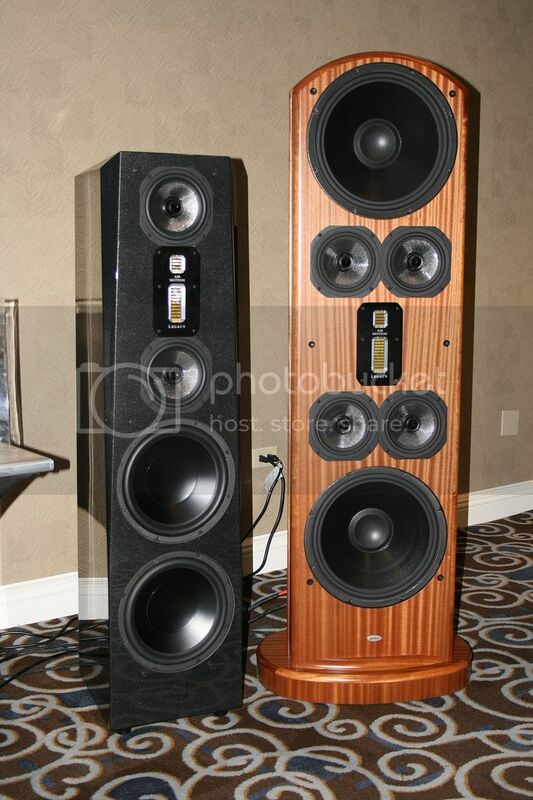 The low end on these was very clean - not boomy or flabby at all. It is really quite chilling to be able to hear every snap of a drum! 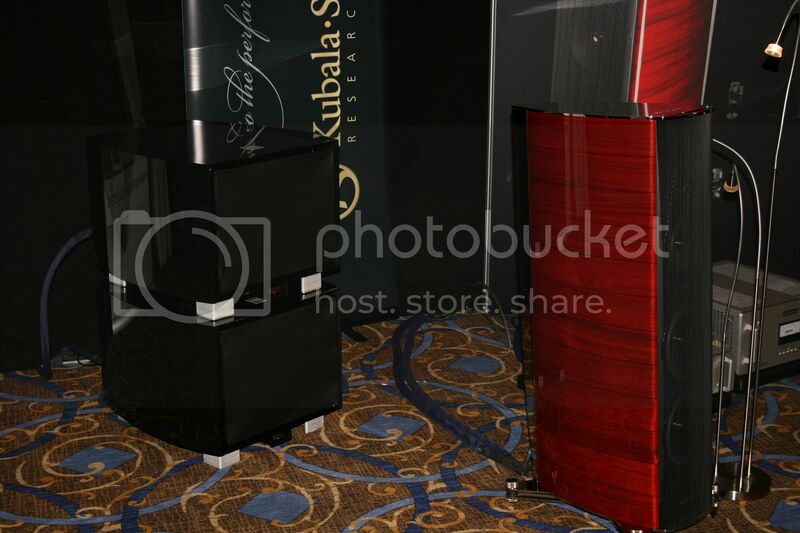 The MSRP on these speakers is 36k. The stated frequency range is 25Hz - 30,000 Hz with a sensitivty of 90 db and a nominal impedence of 4 ohms. I plan to revisit this room as they also had a set of the new Venere 3.0 speakers set up, but they were not playing those during my visit. Next up was the Legacy Audio / Morrow Cables room. I actually spent part of the first hour of Saturday in this room as well as I wanted to get a bit more listening time in on the Whispers. All four of these speaker use the new dual Air Motion tweeter which allows them to extend bandwidth and dynamics due to the premium grade Neodymium magnetics and Kapton diaphragms which are stable to 750 degrees farenheit. To construct the tweeter, a 16" square piece of Kapton is folded into a 4" long, 1" wide chamber. This tweeter is mounted on the same faceplate as the complementary 1" AMT ribbon super-tweeter to give more uniform dispersion which gives the treble more weight and natural fullness. I did not get to hear the Whispers very much - what I was able to glean from the time I had was a very wide soundstage with little to no degradation off axis, excellent dynamic range, and excellent clarity and detail. 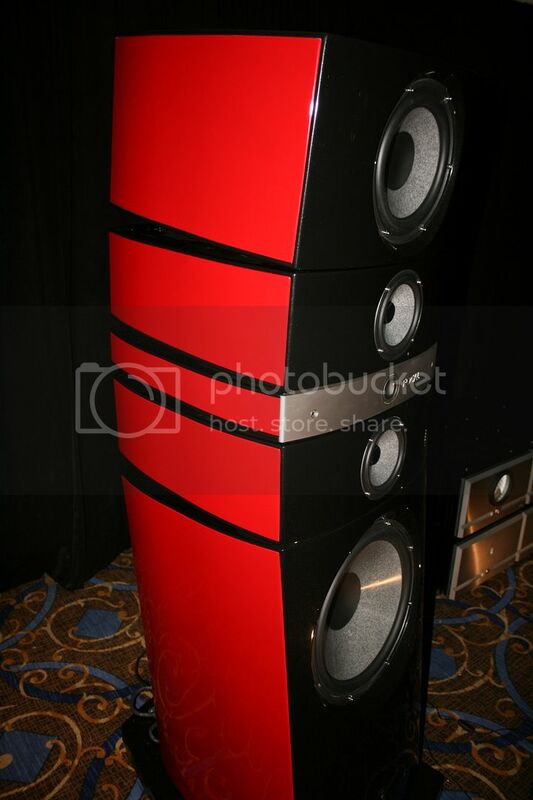 The Aeris speakers have a very unique design and a beautiful finish. 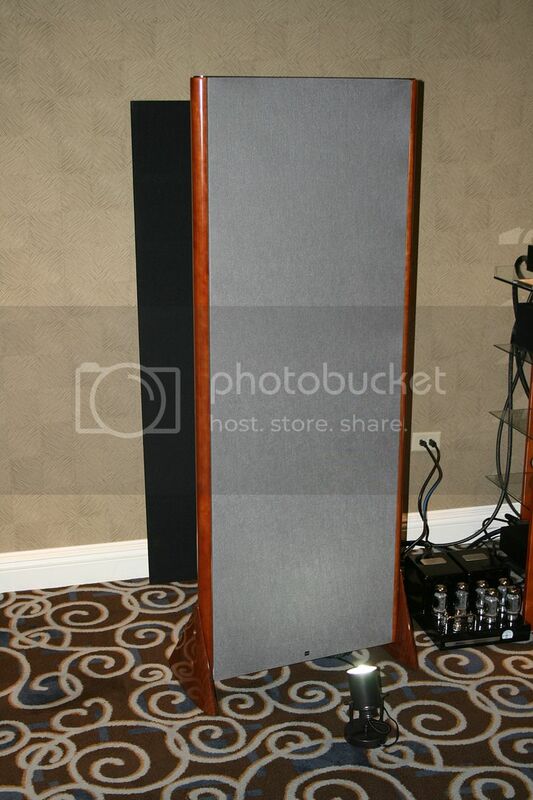 These also had fantastic dynamic range - no doubt a function of the Air Motion tweeter - with very crisp, clear vocals. During one track, there was a bass guitar playing with vocals and I was still able to hear a triangle being struck plain as day. On a different track, you could actually hear the pluck of the pick against the guitar string! Still another track provided some horn action - no desire to cringe when they were played - just excellent detail and clarity. The low end was fantastic as well - extremely tight bass. I actually had a marvelous opportunity to speak with Bill Dudleston himself. He showed me the XP-4080 DSP they were using to do all room EQ and the software that allowed you to tweak specific points and immeadiately save them. It allows up to 30 different configurations - very neat piece of equipment. I knew that Wayne would be very upset with me if I did not get photos of this area! 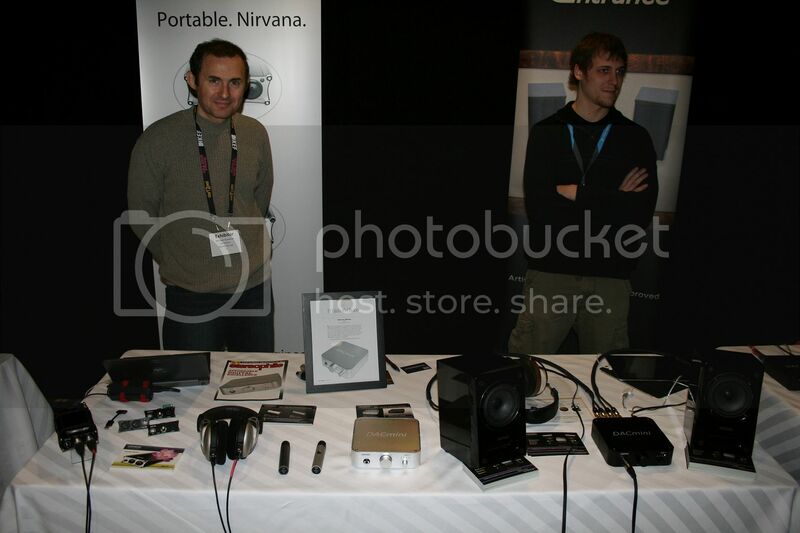 CEntrance had a few products on display - the DACport which is a DAC and Headphone Amp and the DACport LX. The DACport's amp is a Class A headphone amp. The DACport LX, which has a USB to D/A converter, is designed for the person that wants to use an external headphone amp. Both products draw power from the USB connection. 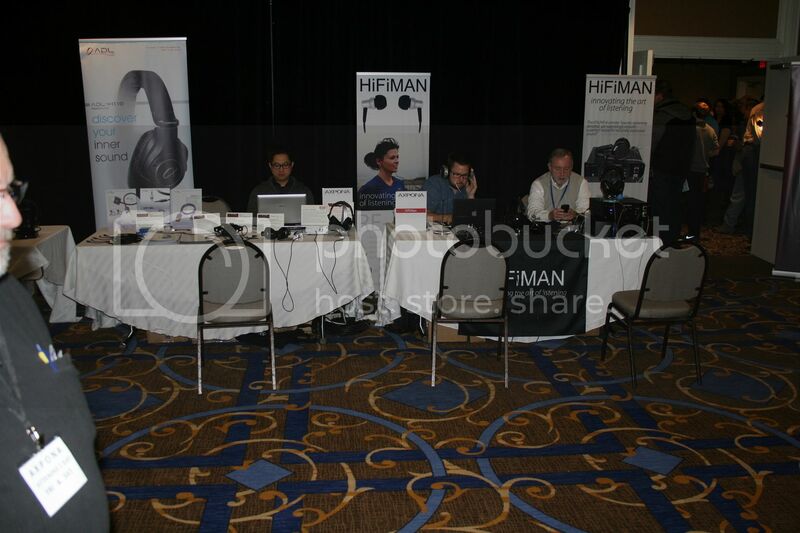 They also had the Audiophile Desktop System that includes the DACmini PX DAC / Amp, the Masterclass 2504 two-way coaxial speakers, and a sturdy travel case for portability. I sat down and listened to this system for a bit, and I was quite impressed by the sound quality of this quite compact desktop system. The MSRP on the system is $1499. Clarity Cable Vortex Power Cords (1.5m) $750 ea. I had been hoping that there was an electrostat here as Sonnie and JJ have been telling me I really need to hear one. The King III is a full range ESL with a stated FR of 32 Hz to 24 kHz. It is designed with the crossover and step-up transformer in an outboard control driver allowing for more robust components and easier maintenance and connects to the speaker with a sturdy multi-pin connector. This made it possible to design the speaker to be lighter with a stronger enclosure that can be moved by one person. Right off the get-go, I was floored by just how open and full these sounded. I actually spent a fair bit of time in this room as I was continually getting those jaw-dropping moments. First, it was the fullness of sound. Then, it was the dynamics of the vocals and was followed by the snap of the mids - the snare drum was just so crisp and clean. Lastly, I just did not think an electrostat could produce bass on a level with a speaker with a woofer. Boy, was I ever wrong! These played low so effectively that I was sure there was a sub hidden somewhere! This was definitely a mind-opening experience for me - at 26+" wide, they are too wide for my room. However, they do make the Prince 3's which are somewhat narrower that I am awaiting more information on. 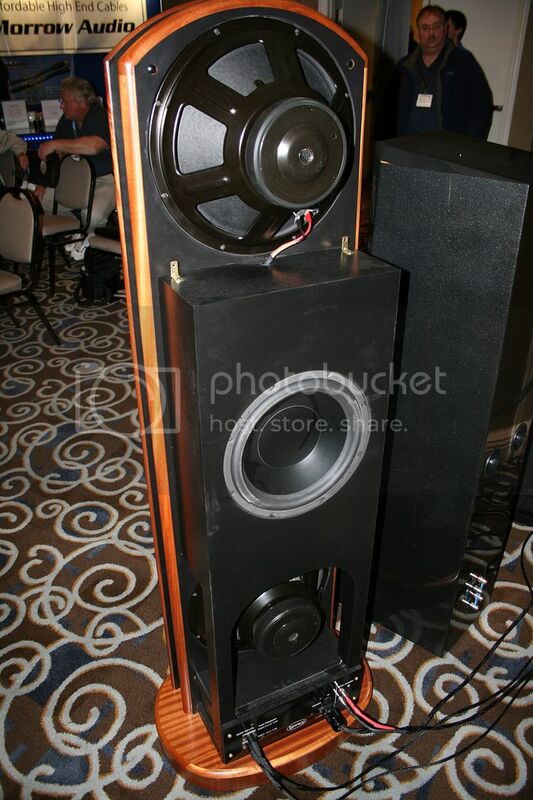 These speakers are designed with two woofers, one midrange, and one tweeter in an open baffle build. 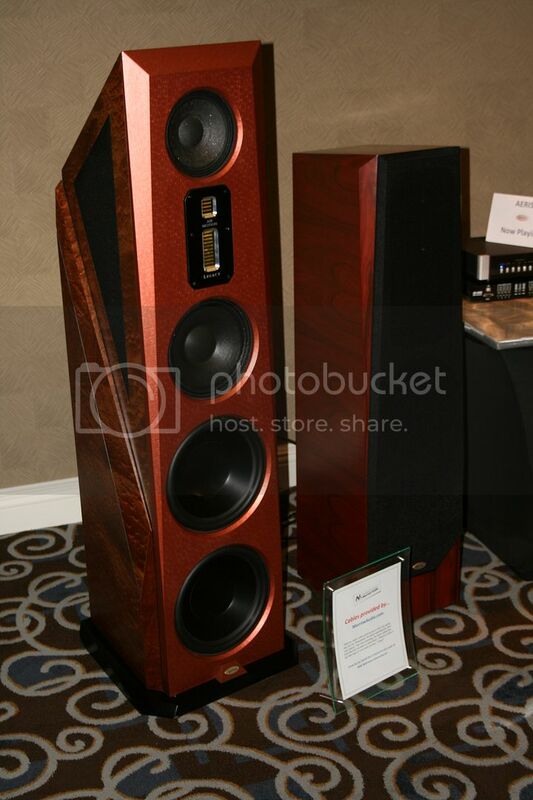 It has a very unique design with either a walnut or silver-painted finish with a stated FR of 35 Hz - 22 kHz. They used no treatment at all in this room. I was impressed with the dynamics - the first track had female vocals coupled with a bass guitar and maintained excellent clarity. I did not feel they imaged really well - I sat just a bit to the left of the sweet spot and I could really localize the left speaker. It just did not have a very wide soundstage IMO. They were also a bit forward and reminded me of my audition of the Studio 100's - without the Studio 100's overpowering low end. After three tracks of female vocals in succession, I was starting to get fatigued and moved on. That said, the clarity of male and female vocals is stellar as well as the piano and cymbals. I could really pick out the stroke of the key and the ping of the cymbal which I really enjoy in a speaker. I was not able to procure an MSRP for these, but a 2010 article lists them at $10.900 / pair.